I checked out this kindle book via WILBOR after a friend described reading it as “entering a bliss-coma.” Perfect for a vacation book, I expected. And if you want an unapologetically romantic, milquetoast, white bread – er, white cake – wish fulfillment fantasy with little and less conflict, Savor the Moment is perfect for you! Laurel McBane is the co-founder and executive pastry chef at Vows, an all-inclusive wedding planning service. Her best friends Mac (photographer), Parker (wedding coordinator), and Emma (florist and decorator) are her co-founders, and the four of them live together in the country mansion where they also host (and cook for) dozens of weddings every summer. Also living and working in their enclave are the soon-to-be husbands of Mac and Emma (see books one and two for their Happily Ever Afters) and Parker’s brother Delaney – the suitably handsome, rich, and dashing hero that Laurel has been in love with half her life. Among a blur of other people’s weddings, and entirely too closely surrounded by friends and a woman called Mrs. G. who acts as nanny and short-order cook for reasons not made totally clear (is she an employee? a relative? a servant? does she owe them a debt!? ), Laurel and Del begin dating. You know the rest. Since they’re already friends, there’s no getting-to-know-you phase. Their whole journey is about negotiating the way their friends and relatives will see them once they’ve transitioned from buddies to bedfellows. This thin love story isn’t a very sturdy backbone for the novel, but it doesn’t really need to be, surrounded as it is by love stories big and small, glorious descriptions of gowns and cakes and desserts and wedding ceremonies, and a lot of meaningful female friendships. The business side of Vows is pretty interesting; I like reading about women who are smart and talented, and making this business run smoothly – coordinating dozens of vendors and hundreds of guests for almost daily events – requires the characters to be brainy and focused. It’s a tough job, and Roberts’ characters are good at it. It’s great to see an author really understand and illustrate the way weddings work instead of glossing over the details, but reading about those details – the stressed out brides, the last-minute changes, the groomsmen who show up late – can walk the line between boring (if you’re not interested in weddings) and stressful (if you remember these things too clearly from your own wedding). 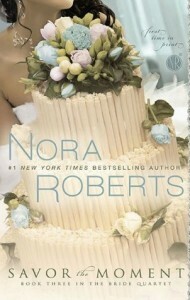 If you adore weddings, brides, cakes, and comforting, easy love stories, this series is the right choice for you.